Yelena Bonner, the human rights activist, co-founder of the Moscow Helsinki Group and Memorial Human Rights Society, and widow of academic Andrei Sakharov, passed away on Jun. 18. She was 88 and spent her final years in Boston with her children. Yelena Bonner became active in the human rights movement in 1968, after Soviet troops invaded Czechoslovakia. She met her future husband Andrei Sakharov in 1970, and in 1972, she married him and resigned from the Communist Party. Human rights activists who worked with them pointed out that Bonner and Sakharov were peers in the dissident struggle. “She used to type up Andrei Sakharov’s articles on a typewriter because he didn’t know how to use one, but they discussed the texts together, as equals,” reminisced Lyudmila Alexeyeva, head of the Moscow Helsinki Group. When Sakharov was awarded the Nobel Prize in 1975 but was banned by the authorities from leaving the country to receive it, Bonner delivered his Nobel speech on his behalf. In 1976, she was among the first signatories of the founding document of the Moscow Helsinki Group, which remains one of Russia’s leading human rights organizations to this day. Bonner moved from Moscow to Gorky (now Nizhny Novgorod) in 1980 to accompany Sakharov in exile, and in 1984 she was convicted of defamation against the Soviet system. 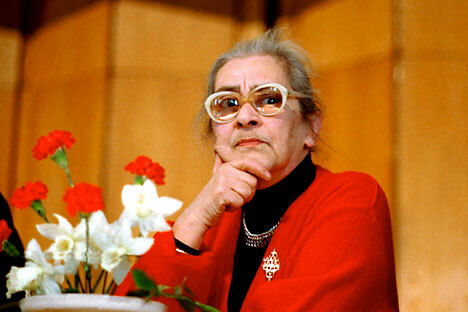 She was able to return to Moscow in 1987 and immediately took part in establishing the Memorial Human Rights Society, another of Russia’s leading human rights organizations. Yelena Bonner continued her work questioning and pushing the government even after the fall of the Soviet Union, and her assessments of the situation in the country were often much harsher than those of her colleagues. She resigned from the Russian Presidential Human Rights Commission in 1994 to protest the war in Chechnya, and soon after immigrated to the United States. “This had nothing to do with politics,” said Lyudmila Alexeyeva. “Yelena Bonner suffered from severe heart problems, and after one of the operations she was advised not to fly, but she wanted to live with her children who had emigrated long ago.” She continued her activism as much as she could, signing open letters and declarations – in particular, a call for Russian Prime Minister Vladimir Putin to resign.